Brussels, 22 March 2012 - At the invitation of the Foreign Affairs Committee of the European Parliament, Dr Mohamed Omar, Minister for Foreign Affairs and International Cooperation of the Republic of Somaliland engaged in an exchange of views with parliamentarians – the first of its kind in twenty years – in which he set forth the objectives and challenges facing his government since their election to office in 2010. As al-Shabaab increasingly shifted towards Somaliland’s mountainous border regions, Dr. Omar called for support in the fight against terrorism and its roots. Economic diversification and building capacity for youth employment would be crucial for regional political and economic stability, he stated, as would be international recognition of his country’s desire for sovereign statehood and the benefits this would bring. 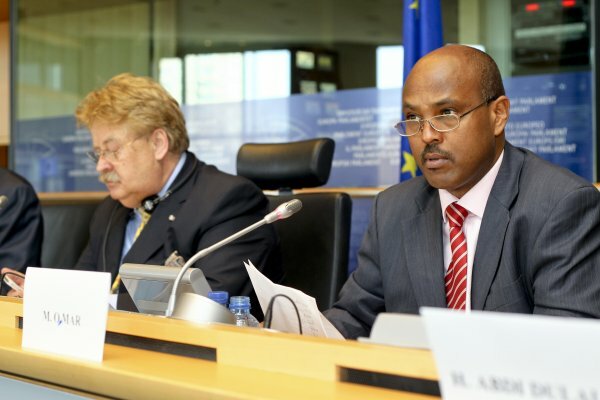 Fiorello Provera MEP, Vice-Chair of the Foreign Affairs Committee, declared in discussions with Dr Omar that “Somaliland’s potential has to be matched – by opening our markets, encouraging investment and building upon the links we are forging today.” Charles Tannock MEP, conveying the strong support Somaliland enjoys in the European Parliament, believed its re-recognition “stronger than Kosovo’s case,” echoing calls he made that Somaliland’s coastguard, prisons, and military all deserved European support. Over the two days of his visit, Dr. Omar met with senior figures in the institutions of the European Union. In cordial discussions with European Commissioner for Development, Andris Piebalgs, Dr Omar stressed the need for development of the economically important Berbera Corridor as artery whose revenues would be crucial in supporting Somaliland’s successful combating of terrorism and piracy in the region and sustainably developing its natural resources, particularly livestock and fish exports.